I have 2 good friends that I have known and loved for most of my life. I met Monica in the 6th grade at St. Louis Catholic School, and we both met Audrey our freshman year at Bishop Hogan High School. (Go Rams! 🙂 ) Life, of course, scattered us around for a lot of years after graduation, but we started getting together several times a year for lunch and chatter about 15 years ago. We’re still at it! I hosted the girls at our home this past weekend for what turned out to be a 5-hour chat & chew marathon. I set the table up on Friday as a dinner table for four, then converted it on Saturday to a simple but pretty luncheon table for the three of us. I’ve also been chomping at the bit to use these table elements. This wonderful mocha-colored “St. Helena” charger from Z Gallerie has such gracefully scalloped edges! The china is “Conservatory Medallion” from the Martha Stewart Collection for Wedgwood. It was love at first sight with its meandering chocolate brown vines and scattered sky blue & mocha medallions. Simple white hemstitched napkins work beautifully for lunch or dinner. The shimmering blue faux gemstone napkin rings, another Z Gallerie find, remind me of staring into little reflecting pools…or Paul Newman’s eyes! 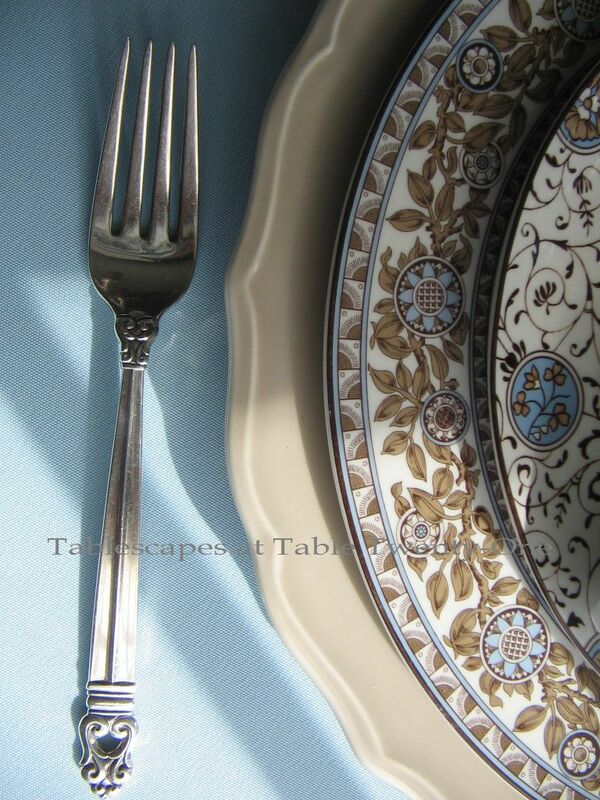 International Silver’s “Royal Danish” sterling flatware makes a great match. Chocolatey brown stemware from Old Time Pottery picks up on the deep tones of the china’s vine pattern. 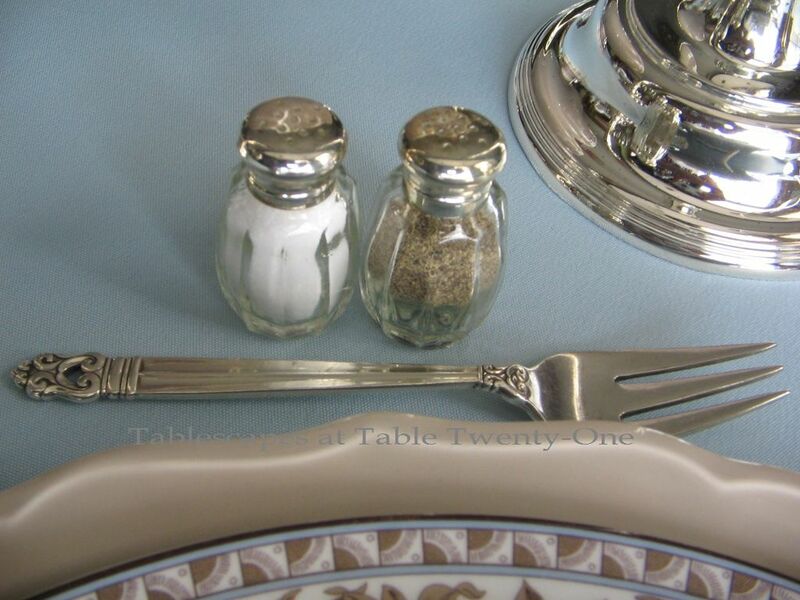 Tiny individual salt & pepper shakers are placed above the dessert fork. Silver Revere candlesticks hold chunky brown pillar candles. A single white Fuji mum lazily floats in a “St. Helena” footed bowl from Z Gallerie. A single, fabulous flower can often speak volumes! The candlesticks were, of course, removed before the luncheon. Please join me at Between Naps on the Porch again this week for Tablescape Thursday. You’re guaranteed to get more than your fill of fabulous tablescapes from bloggers around the globe! You did a rockin’ job of working with two unusual colors in a really creative way! Love this china. That Martha! She does it again. Is she that good, or does she just get good advice? She’s never asked me! PS I finally figured out why your posts disappeared when I clicked on them. All is well! I’m a moron. Oh I love this china set of yours! The blue footed dessert bowls are such a pretty color! The blue tablecloth looks wonderful with the dishes! 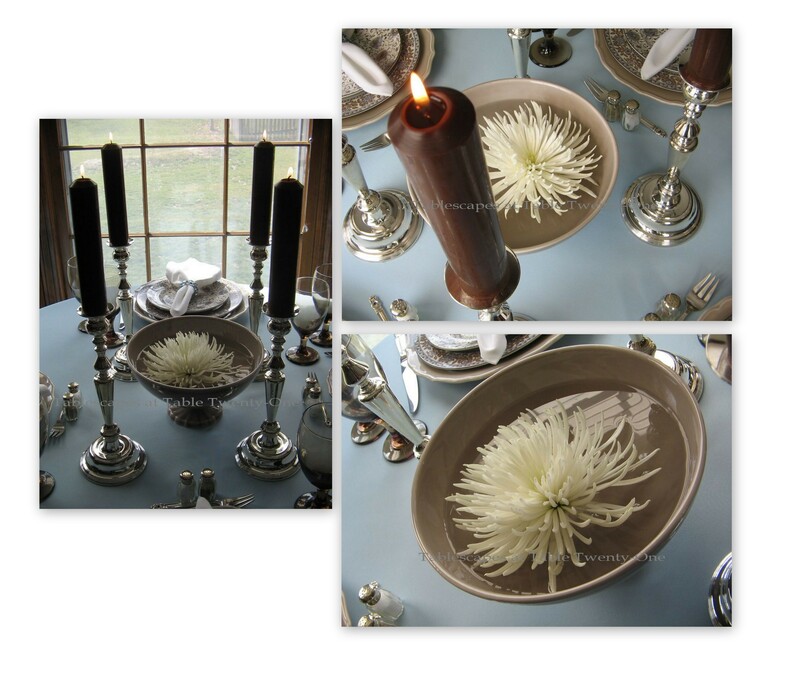 I love how you staged the silver candlesticks with the fuji mum centered! The stemware is soft and pretty- great color too! I see you made me some lemon cupcakes!! Yum! This setting has a soft look to it. I really like ! I loooove these colors! They are beautiful together. The table is just lovely, as always. And you have used my favorite sterling flatware again. I keep watching Ebay, crossing my fingers that there is someone out there who does not have a clue what it is and is selling it dirt cheap. No luck, yet…but I am going to keep looking. HA! A girl can dream, right? Isn’t it great that you can get together with friends year after year that you may not see all the time and pick right up where you left off. True friends are a treasure! I’m quite familiar with the five hour lunch…that’s how you can tell that they’re the best kind of friends. This is one of my favorite color combinations! 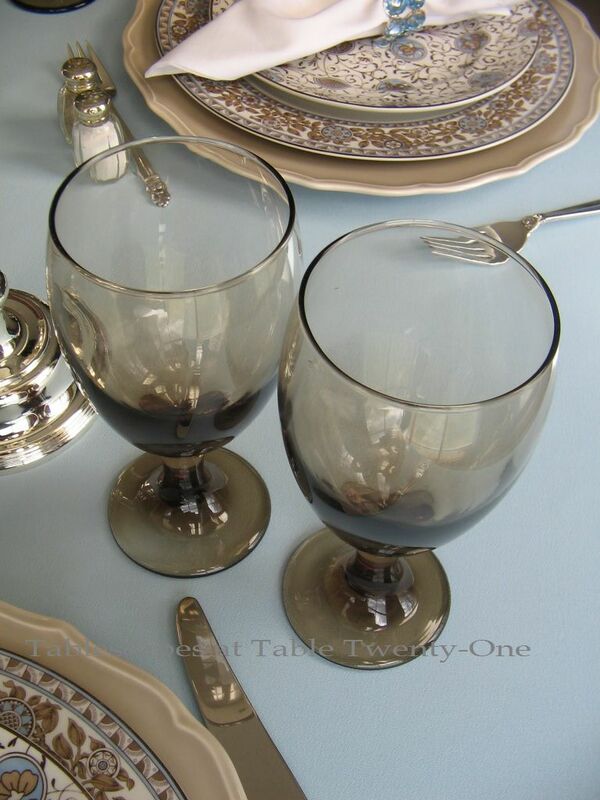 Those dishes are gorgeous and you have made some great Z Gallerie purchases! LOVE that store! 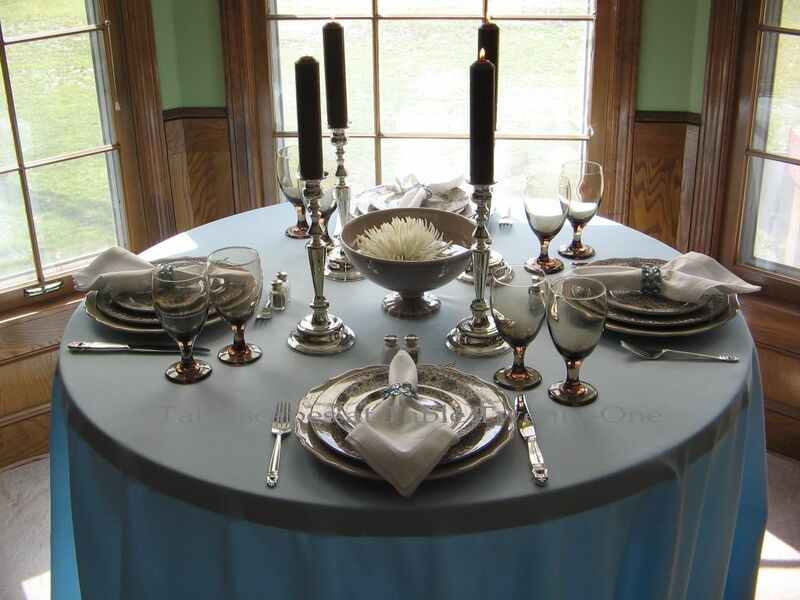 The cloth does drape beautifully and the napkins and bling-rings add to the elegance. The single floating blossom makes for a great centerpiece without hindering the (how many hours?!!!) conversation, and the chocolate pillar candles add a bit of drama. This is just a lovely table, Alycia! And much more tasteful than most of the Oscar dresses! The blue and brown are working it! This is a very soft and elegant table, set the way only you can. I wish we had a Z Gallerie here although I’m sure the Mr.doesn’t. Wishing you lots of fun on your class and can’t wait to hear all about it. Have fun! Beautiful color combination. Monica’s Mom would delight in seeing this. We talk about you girls on many occasions after Mass. You did very well with this setting! I love this china pattern. So beautiful and elegant. And your silver is definitely a favorite. So so pretty. Looks like a fun time!! I LOVE the china and everything that is on the table. Isn’t it a blessing to have such great life long friends…It proves what a wonderful person you are. Oh my goodness, Alycia….that mocha & blue are just delicious together! I laughed at the idea of “a 5-hour chat & chew marathon”…my kinda’ gal. I had a 5 hour shopping marathon that I just posted about. Come see it. I wish I could have joined you gals…it sounds like it was a really special afternoon. forgot to tell you that none of your photos are coming through on my email notices…I just get your name & a blank page. I will unsubscribe & then re-subscribe to see if that will help. Alicia, this is so pretty, I love those dishes! I can see why you have been wanting to use them. They are a such a lovely pattern. 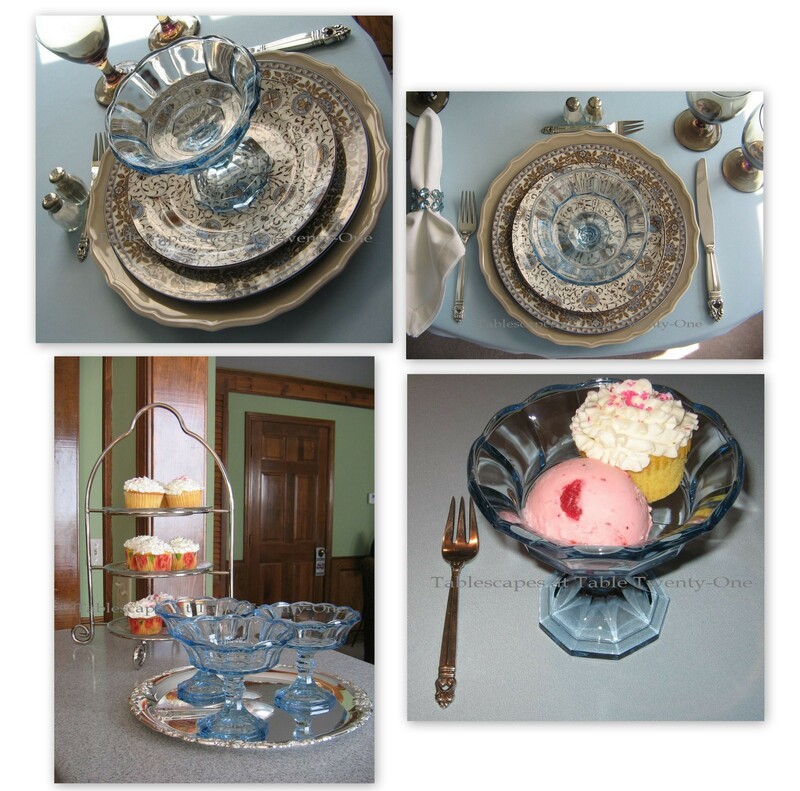 I also think the chocolate glasses and the blue dessert dishes were the perfect match. Sounds like your had a fabulous afternoon! Gorgeous, gorgeous setting! Those dishes are so beautiful. You scored a really great addition with the chargers from zgallerie. The blue dessert glasses are a lovely color and add so much punch. Love the light blue see-through look for the tablecloth. The singe Mum is lovely and holds it’s own. Everything is lovingly put together. Another masterpiece Alycia and your friends are privileged to enjoy this fabulous setting. oh my gosh…to be one of your girlfriends and have the pleasure of sitting at this table…it would be a good thing!! this is such a glorious table – that blue with the lighting from the window is just dreamy! and i like everyone else love that china, you know its so funny to look at patterns and how they have changed over time. this one is just beautiful! What a way to spend a day! Just enjoying and catching up. I am so laughing at your table. I must of picked up and put down those mocha Martha Stewart plates more time than I could count. I didn’t get them and you did! Just like last week. I’m also liking those simple mocha colored glasses. I could use those in my collection. Wish we had an Old Time Pottery near us. Hope you were safe from all of the storms! How fun! We just got together with girlfriends that we have known since childhood and it too was long – a 7 hour stint and then we got together again the next day! No one served lunch though – we went out. I just adore your new Medallions – I haven’t seen that. The colors are so gorgeous and the scrolling and medallions are wonderful. What a fun get together. Sounds like you had a great time.How about a cupcake. Every thing looks elegant. So pretty Alycia. I love the table, the elements and the light! Beautiful table, Alycia…so is that china! Alycian, I just love blue and brown together! Your china is gorgeous! Great job! Brown is my favorite color, so I adore this. You did a wonderful job and there is nothing like enjoying old friends. I know you made them feel very special! This is so pretty! I love your china and the footed dessert bowls. The colors are beautiful. Love that color combination, always subtely rich looking and elegant. Like so many of your other commenters, I too wish I could have been at that table. With your fabulous sense of humore I’ll bet you had your guests rolling in laughter. Beautiful job, Alycia. I just love the footed dessert bowls, their color is my favorite! A very pretty and elegant table setting! Your china is so pretty! 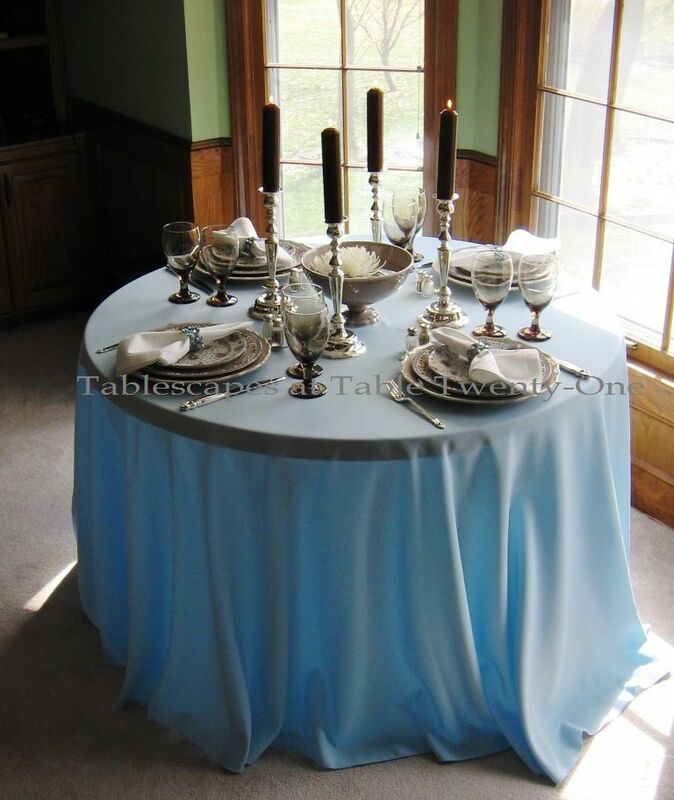 I love the mocha & blue together….the tablecloth makes the whole table. I love silver, it gives everything an elegant flair! It is so nice to have friends in and forget the time. Beautiful table and a such pretty color/pattern mix! Nothing quite as much fun as lunch with “the girls”!! And now I’d like dessert please! Chat and chew, I love that! I am usually the last one finished as I chat so much! I really love this table, the colors, the china, just so elegant. Perfect for the ladies. And the dessert glasses, wow! And while we have CTS, we have no OTP, and they look like they have a lot. I love those glasses. Going back for another look! Your table is absolutely beautiful and oh so elegant! What a wonderful treat for your friends. I always love your tables but this one really got me! I love the color combination. Great finds from ZG too. These are my favorite colors right now. I hope I can finally leave comment. I’ve had trouble in the past and have given up but am trying 1 more time. Thanks for all your wonderful comments. Are you teaching that course? If you are, how’s it going? Alycia, I got such a giggle about the naughty see through table cloth. I love the blue theme and that gorgeous china and sterling. The Fuji mum looks so pretty floating. Thank goodness the storms are over. Hope you don’t need your downstairs closet any time soon…because of the weather. 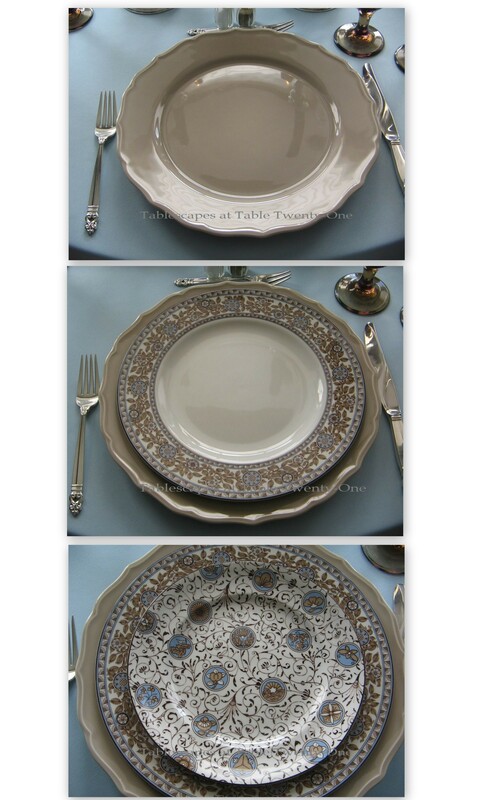 I am in love with your dishes, totally gorgeous, along with the sexi tablecloth in blue, such fab combo! Your tablescape is so beautiful caz I love mocha and I love the blends of this color. The mocha chargers pick up the beauty of the layer dishes you chose. Alycia my friend, you’re one talented tablescaper! Thank you for your lovely visit to my mom’s tea party. Yes, she entains her friends a lot and us too. She’s a good cook, even though she says she doesn’t remember everything she used to do when younger, and yeah, I do remember we always had guests at home, for dad’s birthday, M. Day, Thanksgiving, C’mas, etc. Remember she lived in NY, I am from Astoria-Queens. My dad died 16 yrs. ago. I’m so happy I have my mom living here, so this time I just sneeked to take some pics of her table…I wasn’t invited, just her oldies but goodies, lol…Have a nice evening sweet pal. So nice of you to host your friends. We all have friends from different stages of our lives, but I find that there are some that even if you don’t see them for a long time, when you re-connect it’s like you’ve never been apart!! The colors of your table are so beautiful, that blue is just gorgeous! Your Wedgwood china is the star of the show, and those napkin rings are a close second. Paul Newman did have beautiful eyes, didn’t he?? Such an elegant table, I bet you and your friends had a blast. I would have liked to be a fly on the wall (wink)!! Very pretty combination. I had never seen the Conservatory Medallian pattern of Wedgwood’s before. 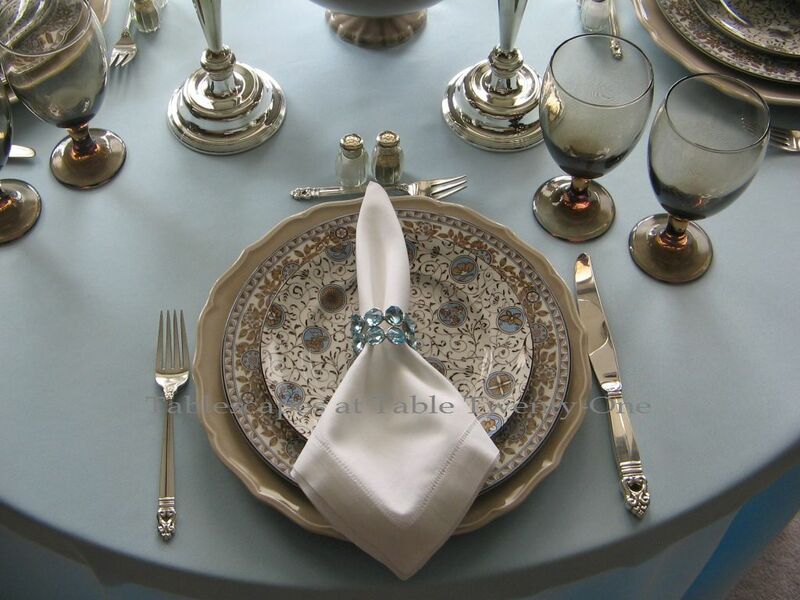 Perfect pairing of the napkin rings and dessert bowls to bring out the blue of the china and tablecloth. Loved how you floated the Mum in the bowl — very classy. I’m sure all you gals had a smashing good time and they really appreciated the time you took to make the table special. What a delightful gift of friendship your table is. What I love is imagining the stories and laughter you gals shared around it. Is there anything like the memories that are conjured up when you spend time with people who are part of your past? Of course, there’s always the risk of those embarrassing moments, the ones you prefer to forget, being remembered as well. OK, this one is absolutely lovely! I love the place setting so much. The plates are beautiful. I also love the way you had it set in front of the window. Of course, one of my favorite things is the way you talk about your friends and the time you spend. We do the same thing in our luncheon club. I just loved the phrase “chat and chew marathon”. I think I’m going suggest naming our luncheon club “Chat and Chew”. That’s just grand!